<strong>"Stalemate"</strong>: Supervisors Peter Adam and Doreen Farr shared frustration Thursday at a County-Chumash subcommittee meeting over land annexation. The biggest bombshell during Thursday’s Chumash-county subcommittee meeting came when Santa Ynez Valley resident Bob Field announced he is jumping in the 3rd District supervisorial race. Field — a self-described old-fashioned conservative and characterized as a staunch anti-development advocate — has for years ardently opposed expanding the tribe’s existing reservation. Most prominently, the tribe is seeking to annex a 1,400-acre property, better known as Camp 4, which would effectively remove it from county tax rolls and pave the way for development without following the county’s strict planning process. Field’s candidacy seriously increases the chances the election will be decided in November rather than in the June primary election. (A candidate would need 50 percent of the vote plus one vote to win in June.) 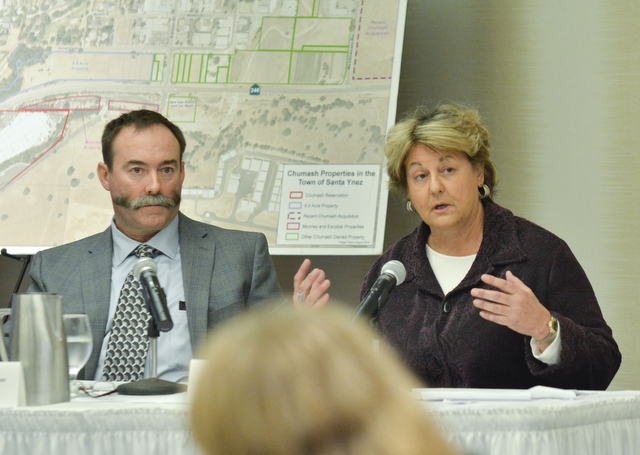 The other three candidates already in the race — Isla Vista resident Jay Freeman and valley residents Joan Hartmann and Bruce Porter — were also at Thursday’s meeting at the Marriott in Buellton. 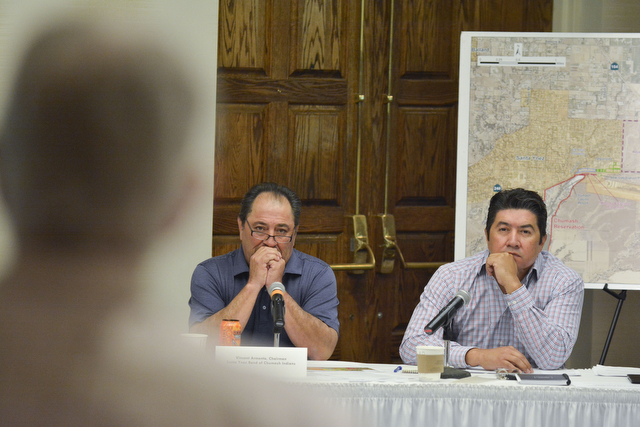 On Thursday, Armenta announced he would recommend that the tribal board submit applications with the BIA to annex every property they own, or seek federal legislation to do the same. “I don’t think the county has left us any option,” he said. 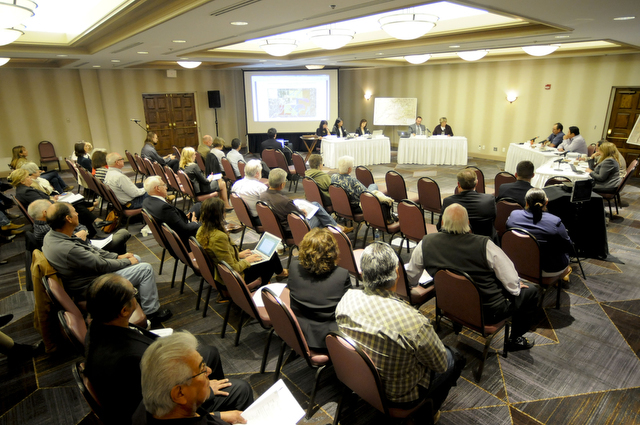 The heated meeting was the seventh in a series of public talks between supes and the Santa Ynez Band of Chumash Indians. Since September, the subcommittee has made steps to draft a terms sheet. That document outlines the following key issues: payments in lieu of taxes, mitigation, county services, and — especially controversial — gambling. “I believe through this process we have given the county everything that they have requested,” Armenta said. The tribe agreed to pay 38 percent of one percent of the market value for services to compensate for ongoing property tax loss. The tribe also agreed to pay sales tax and Transient Occupancy Tax (TOT) equivalent to county rates (25 percent), with the money split between the county’s general fund and the area school districts. Tribal Chairman Vincent Armenta (left) and Mike Lopez (right) of the tribe's Business Committee hear public comment. Adam shared Farr’s frustration. “You got us to chase you awhile, and it’s not working for me. In terms of the five big issues, I don’t think we’ve achieved any understanding here,” he said. “We’ve gone so far away from where I was trying to take this thing in the beginning.” He went on to acknowledge their fiscal concessions. Field’s decision to run for Farr’s seat was also surprising because late last year he donated $1,000 to Hartmann’s campaign. (Farr, who is retiring at the end of this term, has endorsed Hartmann.) And just recently, Field worked with Hartmann on an alternative proposal that would allow the tribe to develop housing on the triangle property with an accelerated permit process. In exchange, the tribe would drop their application to annex Camp 4. On Thursday, Armenta dismissed the idea and said someone in the community would oppose any project they proposed. During public comment, Hartmann expressed disappointment that “just as we were getting close to an agreement,” the tribe “upped the ante.” “The latest proposal seems to be a giant step out-of-bounds,” she said during public comment. Porter, who was in attendance but did not speak, said in an interview earlier this week he is opposed to putting more properties into trust. During public comment, Freeman asked if the meetings were set up to fail and asked that everyone take a step back. A hearing will be held at the Board of Supervisors to continue the discussions. A date has not been set.